When we think of the holidays most of us think about spending time with our friends and family. However, as a business owner this is a time that’s full of lots of potential for you, especially now that consumer confidence is at an all-time high and unemployment is low. This is a combination that could create a great holiday retail season for your business… if you are prepared for it ahead of time. The right strategies can help your business reap a significant financial gain by the end of this year. However, you need to know what strategies to use to maximize these profits. With this in mind, here are a few things you’ll want to know (and do) so you can make the most of this holiday season. A combination of targeted advertising, strong SEO, and good content marketing is honestly the best way for a business to combat the holiday season. The first step here is to learn what people are searching for. You’ll want to create good content and copy for these things. Make sure to combine it with a great sales offer. This will help you draw even more customers to your website throughout this holiday season. Unfortunately, many retailers will find themselves leaving money on the table this holiday because they didn’t accurately forecast consumer demand so they couldn’t buy enough stock. This isn’t something that most online retailers will find themselves dealing with because they have lots of information available to them about their existing customers and who’s been visiting their website. Of course, it’s important for them to make the most of this information when creating a purchasing strategy. Today’s online retail market is highly competitive, especially throughout the holiday season. This explains why it isn’t the amount of money you put towards an advertising campaign that matters but the quality of your targeting. As such, you must have a good understanding of your products or services and the people who buy them. You’ll want to remember these things when you optimize your SEO so you can stretch your money as far as possible. Don’t wait until holiday time to start planning your marketing and especially your SEO campaigns and advertisements. You need to know what products or services in your niche are trending so you’re prepared. Stock up on products ahead of time so you can avoid paying more for your inventory. Don’t be afraid you won’t be able to sell these things. Instead, offer discounts and sales then at the end of the holiday season offer a blowout sale so you can get rid of your remaining inventory. Once the holidays hit it’s too late for you to worry about SEO. Instead of worrying about what you should have done differently here, spend the next few weeks focusing on the customers you already have. These are people who will likely buys something from you again and tell others to do the same. With a successful email campaign offering gifts for such referrals, you’ll make a huge impact. 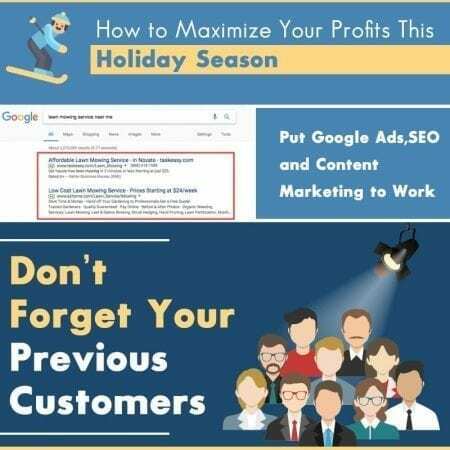 You already have enough to do this holiday season so let the Local SEO Tampa Company take care of all these things for you. By doing so you’ll free up more time to celebrate the holidays with your friends and family while also ensuring that you make the most of this shopping season for your business. Contact them today and let them help you in the same way they’ve helped many other customers through the holiday season in past years.